On the west side, the Going-to-the-Sun Road is open for vehicle traffic to Avalanche Creek, approximately 16 miles from the West Entrance. 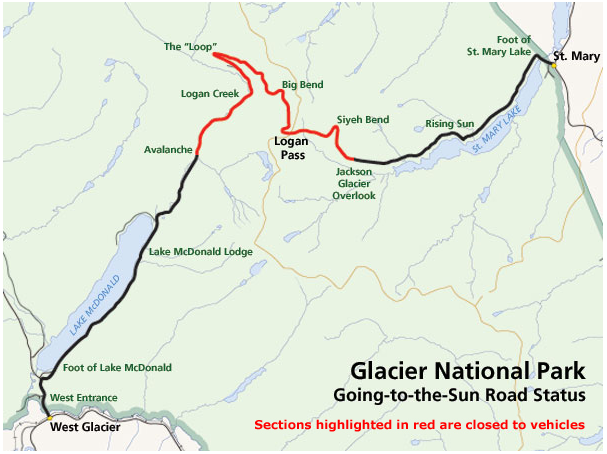 On the east side, the road is open to Jackson Glacier Overlook, approximately 13 miles past the St. Mary Entrance. On the west side the hiker/biker closure is located Road Camp, approximately 10 miles past Avalanche Creek, while the road crew is working. The section of road between Avalanche and the Loop is also posted due to bear frequenting. The hiker/biker closure on the east side is located at Siyeh Bend, approximately 2 miles past the vehicle closure, while the road crew is working.